You are here: Home / News / What Does Opportunity Look Like? This is Brian Lee. He is a 41-year-old, single father of Morgan, his 3-year-old little girl. 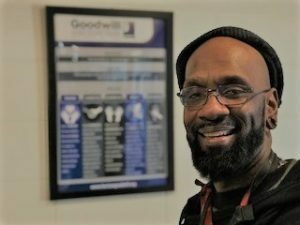 Initially, Brian came to Horizon Goodwill as a Community Service Worker seeking to complete hours necessary to maintain his temporary cash assistance from the Department of Social Services. His story is one of finding opportunity in the middle of difficulty – of asking for help in removing the barriers you face and making the most of what happens next. Hi, my name is Brian. I am a 41-year-old, single father with a 3-year-old little girl. I came to Horizon Goodwill in Spring of 2017 to complete mandatory community service hours in order to keep our food stamps. At the time, I was homeless – we were homeless. Think about if you didn’t have a bed for you little girl to sleep in at night? A safe, warm place for her to play? I wasn’t providing for her, and it made me feel angry and useless. There seemed to be so many things in my way. I didn’t know what to do. After I received food stamps and assistance at Washington County Department of Social Services, they referred me to Horizon Goodwill to complete my 60 hours of mandatory service. There I met a whole team of Horizon Goodwill staff. When I completed my hours, I enrolled in Horizon Goodwill’s Get Onboard! 10-day job readiness program. That’s where I met Tammy, our job readiness instructor. I learned about conflict management on the job, dusted off my basic math and literacy with GED prep classes, completed my resume, and got my first interview outfit for free. Really, though, what Tammy taught me – it’s hard to explain, but she made me feel like I could do this. I could take care of my daughter the right way. The Goodwill team got us into a shelter, and by then I graduated into the paid work training program. Over the last 7 months, Goodwill has done so much for me. Every time I think of Tammy, I am so grateful – but not just me, for my little girl. I got my forklift certification, I have a job, and now I have my own place for me and my daughter. It’s so great. For anyone who wants to do anything with their life and move on and up, this is the place for you. If you want a better life, come to Goodwill. It will be the best decision you ever made. To learn more, check us out on Facebook, Twitter and our website, www.horizongoodwill.org. You can also email me at cfleming@goodwill-hgi.org.